Bacon Pâté? Um, yeah, okay. Er, I guess. Not much to look at, I thought, peering through the thick plastic package. Still, it beckoned to me as I navigated the narrow aisle that bisects Polam International Market, one of the bright spots for Polish food in Greenpoint. 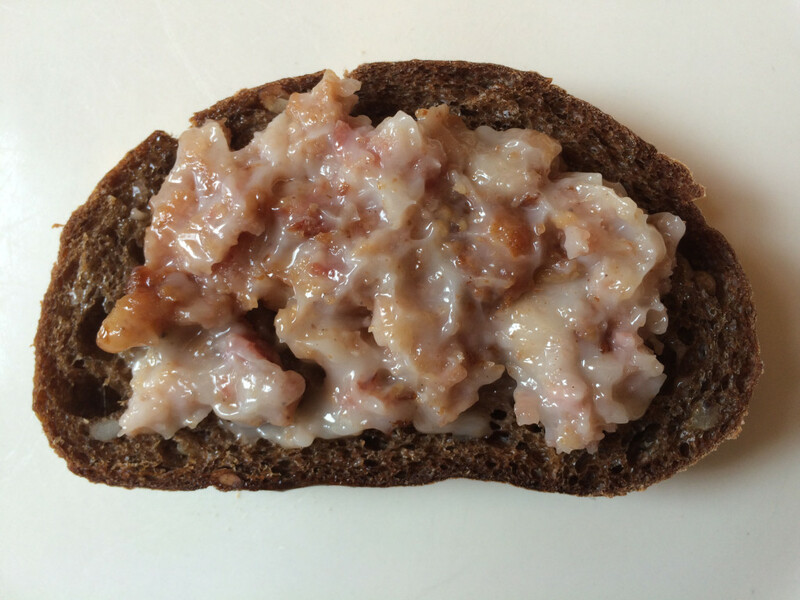 Seems like an oxymoron: I think of bacon as having ribbons of fat interspersed with lean (the Jack Sprat recipe for marital harmony) and pâté as a paste, coarse or fine, but easily spreadable. I couldn’t be certain of course, but this looked like little chunks of fried bacon suspended in lard. At home, I poured it into a bowl to get a better look. It still looked like little chunks of fried bacon suspended in lard. Because that’s precisely what it was. 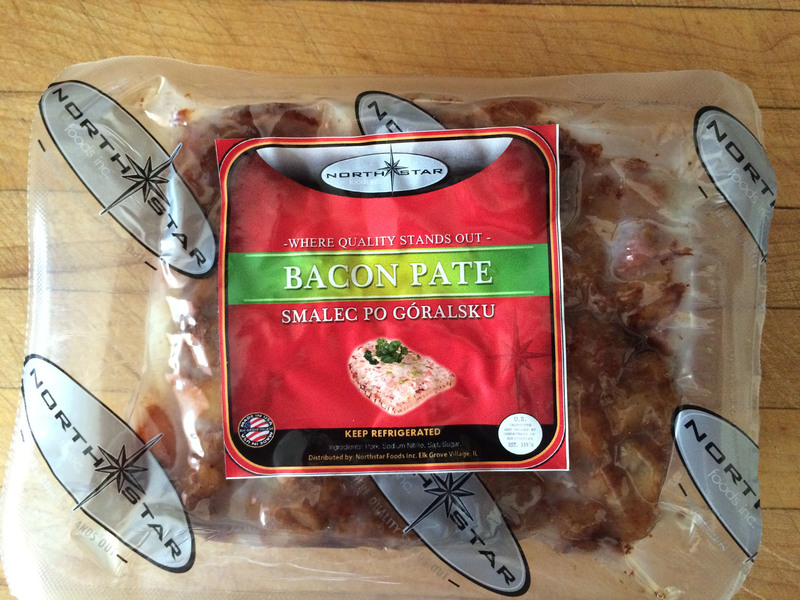 So I went online to learn more about what to do with it: Smalec po Góralsku translates as Mountaineers’ Lard. “Spreadable bacon goodness!” proclaimed the description. “Traditional simple peasant spread typically used as a substitute for butter – put it on the dark bread, add some salt and you will enjoy the Polish mountain village specialty.” Okay, I’m game. For starters, I had to get past the fact that I was about to wrap my lips around glorified lard supported only by a piece of excellent pumpernickel. (I had long since given up on trying to figure out an explanation for the “pâté” part.) I took a bite. I understood where it wanted to go, but its charms were eluding me. I felt that it had potential however. What could I do with it to make it delicious enough to write about? And then I remembered Zoltán. Zoltán was an affable fellow of Hungarian descent who lived in the country. (When you’re a New Yorker, anywhere on the far side of a bridge leading out of the city is “the country”.) I hadn’t thought about him in years. His claim to fame was that every summer, he’d get a fire going in a little pit in his backyard and make Szalonna. He’d impale a hunk of Hungarian back bacon on a stick and hold it over the flames and just as the fat began to sizzle and render, he’d pull it out of the fire and hold it over a piece of fresh bread until the drippings dwindled. Then back over the flames it went for another round – repeatedly until the bread was saturated. Sometimes it was topped with onion, cucumber, or bell pepper. Neighborhood kids would come running to his yard as the heavenly, porky aroma filled the air. The Good Humor man had nothing on Zoltán. So taking a tip from those ancient sense memories, I concocted a plan. Caramelize thinly sliced onions very slowly in the bacon pâté. 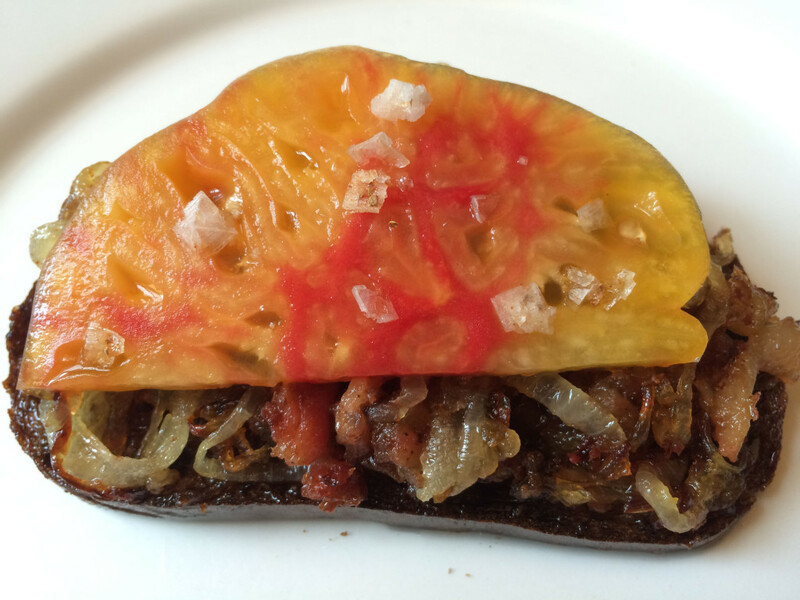 While they grow sweet, slice an heirloom tomato and oven toast a slice of pumpernickel. When the onions are done, drench the toasted pumpernickel in the rendered lard, add the onions and bacon pieces, top with a slice of tomato, and sprinkle with wild mushroom sea salt. Looks good, doesn’t it? Tasted even better. Of course, I had to go through several of these to make sure they were as wonderful as I thought they were on the first bite. Ah, such sacrifice. This entry was posted in Pantry, Stories and tagged Polish by Rich. Bookmark the permalink.